Everyone has different ways on marking an amazing time or experience in their lives, I do scrapbooks, take photos, make artwork, but nothing quite keeps that experience with me than a tattoo. I have quite a few tattoos and not all of them are travel related, but all are about something close to my heart. I have more than ever recently wanted to get travel related tattoos. I have many in the planning and have a Tokyo one sketched out ready to go for later on in the year. After being an apprentice for a year before starting my MA tattoos are something I feel very much connected to and passionate about, I feel the body is a blank canvas ready for life to make an impression upon it. My most recent tattoo, done my Martin Blair of 13 Familia tattoo in Preston, is one I have wanted in some form or another since the first time I visited NYC. It is somewhere I instantly fell in love with and wanted something to represent the fact I will always carry that with me. Getting my first large tattoo on my arm is a big step I guess, but I wear my heart on my sleeve (literally!) and I feel this is representing who I really am and the culture I feel connected to. You may also just be able to make out my other two tattoos on that arm. I have the Mets cap logo on the side and the words “Reise, Reise” on my wrist. That means “Travel” or “Journey” in German and is also a song by Rammstein, on of my favourite bands. The NY tattoo came a little closer to these than expected and I am thinking of incorporating the Mets logo a little more and filling the space above (Just below my elbow) with a quote about New York from “The Great Gatsby”. One of the biggest tattoos for my was getting my ship done on my leg (By Rob Ratcliffe, Border Rose Tattoo). This was something I had again been thinking about for a long time. I wanted something very old school to represent the idea of travel and exploration, of following your heart and adventures. I also liked the idea of the old sailors setting off into the unknown and the history connected to tattoos of this type. 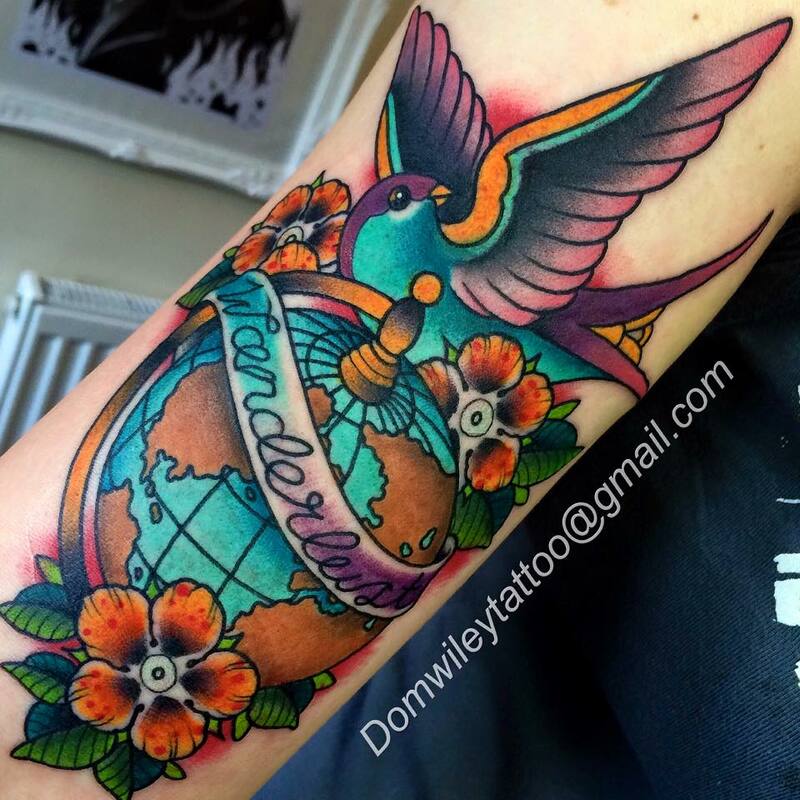 I just had this Wanderlust tattoo done at Blue Cardinal studio in Littleborough, Greater Manchester by their resident old school artist Dom. It’s pretty self explanatory really but I just felt like I wanted to get something which wasn’t necessarily as specific to a particular place but instead was just about my general love for travel and desire to fly free and see the world! I have been wanting this for a long time but no one has really managed to put a design together that I was really happy with until now! Further update…You get the pattern here! We both had matching tattoos done after the most amazing trip of our lives over to Switzerland! I am keen to get something Tokyo related and it might be something we both get like a Daruma doll. I also want a Russian doll with St Basil’s painted on to it and off course now need to get a clover after our amazing trips over to the home of my ancestors (and possibly some Dropkick murphy’s reference in there too). Seeing as we loved Krakow so much I imagine that would feature in the future. I also hope that whilst travelling long term we can get some tattoos in the countries which are featured in them or in some form of traditional fashion such as hand poked in Thailand. I am sure as we fall in love with more and more countries I will want an impression of them on me somewhere! Will Hatton of the Broke Backpacker has a pretty amazing story about getting a traditional tattoo in The Philippines by the traditional Whang Od that is something we would also love to do! I kind of also want some Disney tattoo, maybe Toy Story… I could go on and on, I would be dangerous if I actually had money! 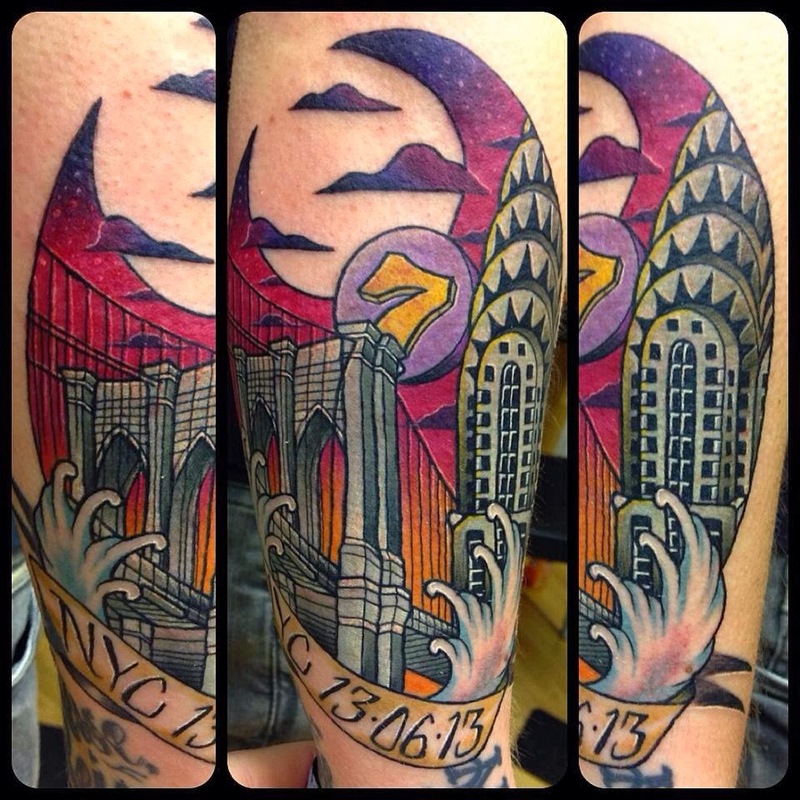 Do you have any tattoos of memorable trips or that represent your wanderlust? Bookmark this article Travel Tattoos. Marking your memories. Le Tour De France Comes To My Village! !